After a little turmoil around Protagonize’s global site licensing policies last week, I’ve completed the changes I had discussed in my previous post. All of our authors should now be able to select a default license by editing their profiles. 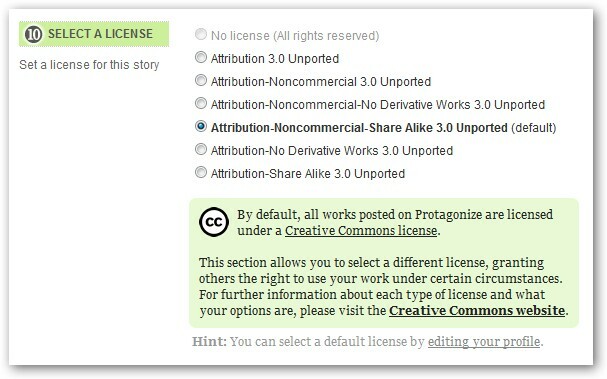 The site default remains a Creative Commons Attribution-Noncommercial-Share Alike 3.0 Unported license, but you can now select an alternative default (or no license) if you so choose. If you’d like more information about the standard Creative Commons license Protagonize uses for all work, please check out our related FAQ entry. 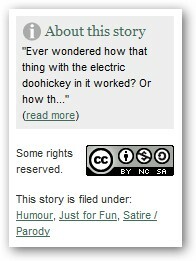 In addition, you may have noticed that I’ve added a new section at the bottom of our writing form for all new works on the site where you can select a Creative Commons. If you’ve set a default in your author profile, that license will be the automatic selection you see there. If you haven’t set anything up, you don’t need to change anything, and the default site license will be used unless you select something else. The only gotcha here is relating to solo stories; the option to select “No license” only applies to solo, individual works. That was something I decided on immediately because it doesn’t really make sense to have no license set on collaborative works. 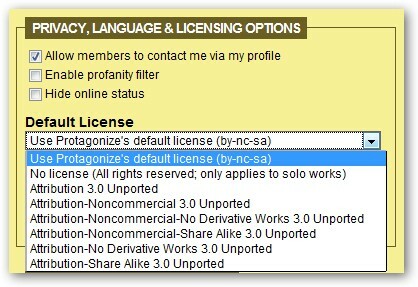 With that in mind, the option to select “No license” is only enabled when you are writing a solo story. If you’d like to go back and change the license on a work you’ve previously written, you simply have to edit the first chapter or branch, by clicking the Edit this work button. The option to select an alternate license for your work will be present at the bottom of the writing form, even for existing works. You can change this license at any time, and it will be displayed on the right-hand side under “The Goods” while you’re reading. From all of the positive feedback I’ve already gotten about these licensing changes, it seems like folks are much happier now that they have fuller control over the licensing of their own content. I’m glad to see that this change hasn’t done any harm, but if you have any questions, please feel free to ask me here, or contact me directly. Thanks for your support! This entry was posted in General, Site updates, writing and tagged content, creative commons, customizing, how to, licenses, licensing, new features, Publishing. Bookmark the permalink.